Written by leading market risk academic, Professor Carol Alexander, Quantitative Methods in Finance forms part one of the Market Risk Analysis four volume set. Starting from the basics, this book helps readers to take the first step towards becoming a properly qualified financial risk manager and asset manager, roles that are currently in huge demand. Accessible to intelligent readers with a moderate understanding of mathematics at high school level or to anyone with a university degree in mathematics, physics or engineering, no prior knowledge of finance is necessary. Instead the emphasis is on understanding ideas rather than on mathematical rigour, meaning that this book offers a fast-track introduction to financial analysis for readers with some quantitative background, highlighting those areas of mathematics that are particularly relevant to solving problems in financial risk management and asset management. Unique to this book is a focus on both continuous and discrete time finance so that Quantitative Methods in Finance is not only about the application of mathematics to finance; it also explains, in very pedagogical terms, how the continuous time and discrete time finance disciplines meet, providing a comprehensive, highly accessible guide which will provide readers with the tools to start applying their knowledge immediately. Calculation of risk adjusted performance metrics including generalised Sharpe ratio, omega and kappa indices. Carol Alexander is a Professor of Risk Management at the ICMA Centre, University of Reading, and Chair of the Academic Advisory Council of the Professional Risk Manager’s International Association (PRMIA). She is the author of Market Models: A Guide to Financial Data Analysis(John Wiley & Sons Ltd, 2001) and has been editor and contributor of a very large number of books in finance and mathematics, including the multi-volume Professional Risk Manager’s Handbook(McGraw-Hill, 2008 and PRMIA Publications). 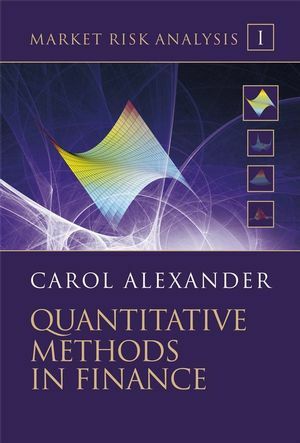 Carol has published nearly 100 academic journal articles, book chapters and books, the majority of which focus on financial risk management and mathematical finance. I.1 Basic Calculus for Finance. I.1.2 Functions and Graphs, Equations and Roots. I.1.4 Analysis of Financial Returns. I.1.5 Functions of Several Variables. I.2 Essential Linear Algebra for Finance. I.2.2 Matrix Algebra and its Mathematical Applications. I.2.4 Applications to Linear Portfolios. I.3.5 Introduction to Statistical Inference. I.3.7 Stochastic Processes in Discrete and Continuous Time. I.4 Introduction to Linear Regression. I.4.3 Properties of OLS Estimators. I.4.6 Applications of Linear Regression in Finance. I.5 Numerical Methods in Finance. I.6 Introduction to Portfolio Theory. I.6.4 Theory of Asset Pricing. I.6.5 Risk Adjusted Performance Measures.